Get glitter polish off the easy way with Glitter Off by OPI! 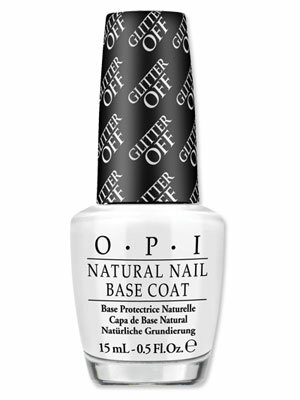 Glitter Off by OPI - $10.95 - a new, peel-able base coat that allows for the quick and easy removal of nail lacquer when applied beneath any glitter or dark nail color. It provides a base for quick one-step removal and protects natural nails, while simultaneously making nail colors brighter. It's easy to use, simply brush on one thin layer of Glitter Off to bare nails, wait until it dries clear and then apply as many coats of glitter lacquer as needed to get the desired look. Designed to last for a few days, allowing for glitter shades to be changed frequently or worn just for a special occasion or night out. And when it’s time to remove - just peel it! To remove, use a cuticle stick to gently push and peel the glitter lacquer off the nail - no nail polish remover needed! I must admit, peeling nail polish off is one of my guilty pleasures so having the license to do it, heaven! I've been waiting for a product like this all my life! I need to get my hands on this, it's sounds amazing!